260 Monday February 25th 1889 Will took Tom to the valley and they brought up two loads of straw. We got their dinner about four oclock. I practiced some in the forenoon. I did not feel so very well in the afternoon and read a little Will went to town in the evening. Lee came home at noon. John J. Holmes commited suicide last night. Tuesday February 26th 1889. The men went after straw again today and were home by three oclock for their dinner. Mother was over in the afternoon to knit some. I read in the evening. Will was at home. I practiced some in the forenoon. Mr. Gillis died suddenly this morning. Wednesday February February 27th It was a very bright day and the men went after straw. They had an upset and were late getting home. I got some practicing done in the forenoon. 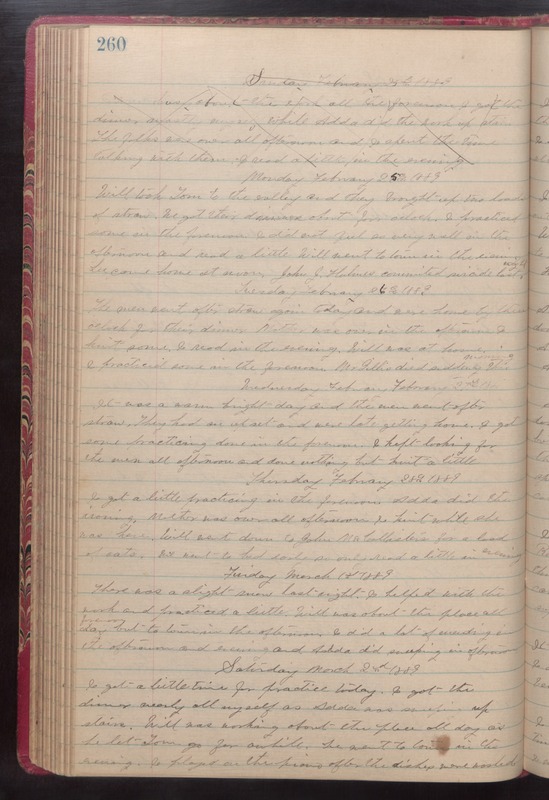 I kept looking for the men all afternoon and done nothing but knit a little Thursday February 28th 1889 I got a little practicing in the forenoon. Adda did the ironing. Mother was over all afternoon. I knit while she was here. Will went down to John McCollisters for a load of oats. We went to bed early so only read a little in the evening Friday March 1st 1889 There was a slight snow last night. I helped with the work and practiced a little. Will was about the place all forenoon but to town in the afternoon. I did a lot of mending in the afternoon and evening and Adda did sweeping in afternoon. Saturday March 2nd 1889 I got a little time for practice today. I got the dinner nearly all myself so Adda was sweeping up stairs. Will was working about the place all day as he let Tom go for awhile. We went to town in the evening. I played on the piano after the dishes were washed.